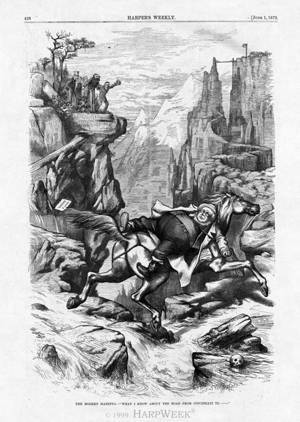 Nast’s theatrical “set piece” of the June 1, 1872 issue introduces presidential nominee Greeley as “The Modern Mazeppa” in “What I Know about the Road from Cincinnati to___.” It is a travesty of the venerable theatrical war-horse, “Mazeppa” (or “The Wild Horse of Tartary”), dating from 1830 and itself based on a swashbuckling 1819 poem by Lord Byron. The play originally depended for its limited appeal on a hair-raising final scene in which a young Polish nobleman is stripped of his clothing by a villainous count, tied to the back of a spirited stallion, and the two, in tandem, gallop across the stage on an elevated runway. An 1861 production starring the seductive actress Adah Isaacs Mencken became an overnight sensation when it was offered in New York City and Albany.